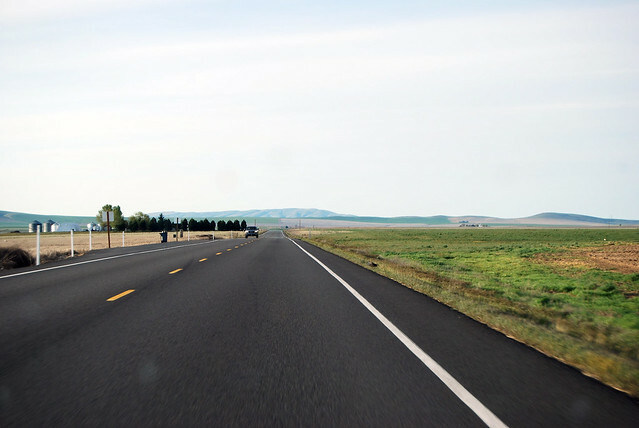 On Saturday, April 20, 2013, late in the afternoon, we drove the length of Washington State Route 221, over the Horse Heaven Hills. Finally on the road again after a long winter's break, we begin at the town of Paterson near the Columbia River, at a junction with SR 14. A sign proclaims the Horse Heaven Viticultural Region. 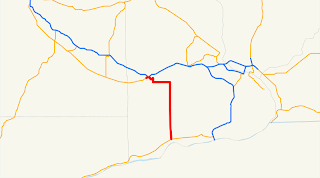 Aside from a slight s-curve when crossing Paterson Ridge, Highway 221 heads due north for the next seventeen miles. We gradually gain elevation northward, crossing rolling farmlands on a big gentle slope that heads back down south to the Columbia River. Very windy along here. When a semi-truck passed us heading the other direction, the relative airspeed combined with the westerly wind hit us so hard it felt like my car's tires slipped on the pavement for a split second. The photo above is thirteen miles up the road, the halfway point. The highway eventually turns west, right toward the sun low on the horizon, as we close in on the low gap in the ridgeline of the Horse Heaven Hills above Prosser. After five miles west, it turns north for another mile. Truckers check your brakes! 6% grade for 2 miles! We stopped at the viewpoint to look down into the Yakima Valley, gazing upon Prosser, Mt Adams in the distance, and the Yakima River glinting in the sun. Back on the road, I coast the car up to 60 mph rather quickly. A couple wide curves and we're down the hill into Prosser. 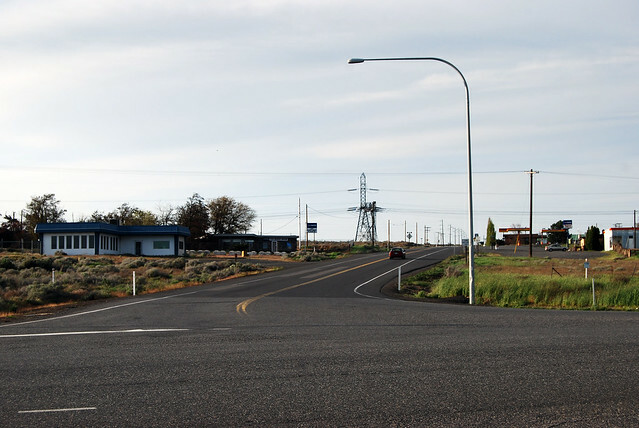 Once on the flat, the runaway truck "ramp" is beside the road, just before the "stop ahead" sign. 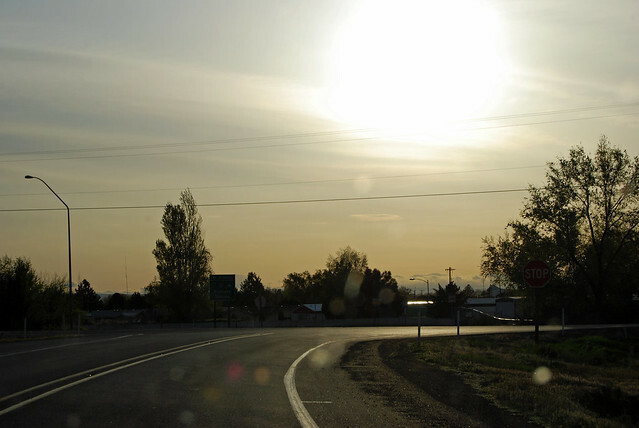 We don't need the gravel to slow us down, so we proceed to the stop sign, where Highway 221 meets its end with its parent route, SR 22. A pleasant drive across farmlands, with a wonderful viewpoint at the top. 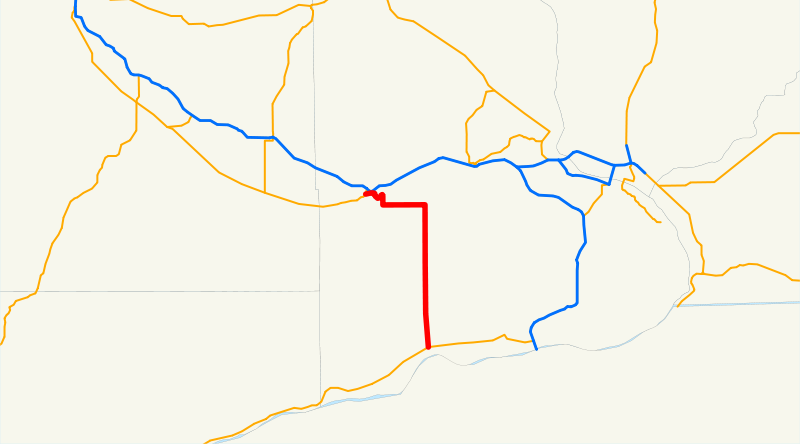 And to think that one of the planned routes of I-82 went over that same gap above Prosser, until the Tri-Cities pulled the freeway even further eastward. 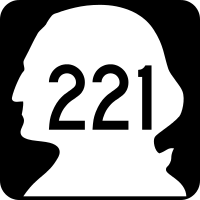 SR 221 wouldn't have existed in that universe, at least not on this road.